The ruins at Jerash are one of Jordan’s major attractions. It’s one of the best examples in the Middle East of a Roman provincial city, and is remarkably well preserved. The history of Jerash is a blend of the Greco-Roman world of the Mediterranean basin and the ancient traditions of the Arab Orient. Indeed, the name of the city itself reflects this interaction. The earliest Arab/Semitic inhabitants, who lived in the area during the pre-classical period of the first millenium BCE, named their village Garshu. The Romans later Hellenised the former Arabic name of Garshu into Gerasa, and the Bible refers to “the region of the Gerasenes” (Mark 5:1; Luke 8:26). At the end of the 19th century, the Arab and Circassian inhabitants of the small rural settlement transformed the Roman Gerasa into the Arabic Jerash. The city received yet another boost in stature with the visit of Emperor Hadrian in 129 CE. To honor its guest, the citizens raised a monumental Triumphal Arch at the southern end of the city. Jerash’s prosperity reached a peak in the beginning of the third century, when the rank of Roman Colony was bestowed upon it. During this “golden age,” Jerash may have had a population of 20,000 people. 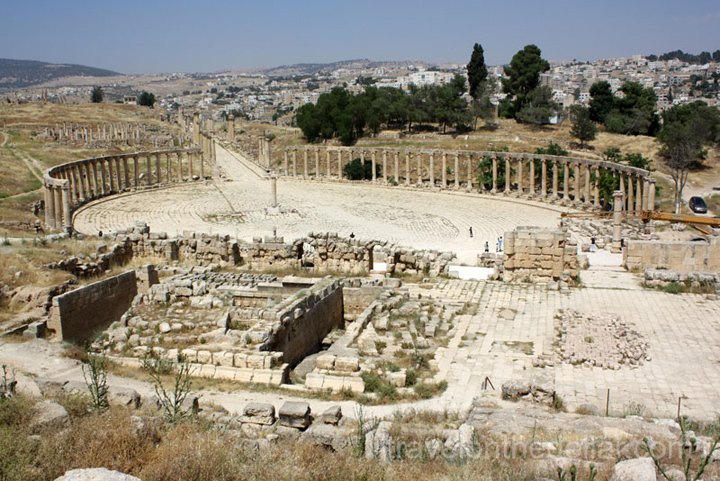 The ancient city preserved today was the administrative, civic, commercial and cultural center of this community, while the bulk of the city’s citizens lived on the east side of Wadi Jerash. As the third century progressed, shipping began to supplant overland caravans as the main route for commerce. Jerash thus fell into decline as its previously lucrative trade routes became less traveled and less valuable. This trend was speeded by frequent uprisings against the Romans—such as the destruction of Palmyra in 273 CE—that made the overland routes more dangerous. In the year 330 CE, Emperor Constantine converted to Christianity and proclaimed it the state religion of the empire’s eastern, or Byzantine, half. By the middle of the fifth century, Christianity had become the major religion of the region and numerous churches were constructed in Jerash. In fact, most of these were built of stones taken from pagan temples. No more churches were built after the year 611 CE. The site now lies on a modern highway that links Amman with the northern boundary of the Kingdom towards Syria; the drive takes 40 minutes (51 km) from Amman at a leisurely speed. As you approach, it is after a corner of the highway that you are suddenly faced with a wonderful view of the ruins with the Triumphal Arch in the foreground. On the other side of the highway lies the modern town of Jerash. From 8th Circle in Amman, take the north-west road out towards Salt. Eventually one must turn northward, but brown tourism signs clearly mark the road towards Jerash. Alpha Daily Tours , tel. (06) 5855196, Organize a full day tour on Friday that includes visiting Ajloun and Um Qais. The tour also includes lunch, entrance fees, English speaking guide. Departure from Alpha Terminal 7th circle in Amman. The bus leaves at 9am. Half day tours also available, click here for more information. From Abdali bus station in Amman, public buses and minibuses (costs 400 fils, 1/25 hrs) leave regularly for Jerash. Jerash’s new bus and service taxi station is a 15-minute walk west of the site. You can take a minibus to the station from outside the visitor centre (costs 100 fils).Plenty of minibuses travel regularly to Ajlun (costs 300 fils, 30 minutes) and Irbid (costs 300 fils, 45 minutes). If you are still in Jerash after 5pm, be prepared to hitch back to the capital. Service taxis sometimes leave as late as 8pm. A private taxi one-way costs around JD 10 (bargain down to JD 7). The tourist police are usually happy to cajole a passing motorist into offering a free ride back to Amman. Built in 129 AD to mark Emperor Hadrian’s visit, this was intended to become the new southern gate of the city. A partially restored Roman-era stadium. At only 245m long and 52m wide, it was the smallest hippodrome in the Roman Empire. An unusual wide, asymmetrical plaza at the beginning of the Cardo (or Colonnaded Street), built in the 1st century AD. The Oval Plaza is 80 m by 90 m (262 ft by 295 ft) and is enclosed by 160 Ionic columns. A 600 m (660 yards) colonnaded street that runs the length of the city. It was once lined with the city’s major buildings, shops and residences. A complex drainage system lies below the stone paving. Look for chariot tracks in the stone. The city’s main food market, which has a central fountain. An ornate public fountain that was decorated with lions heads and dedicated to the nymphs. Impressive temple ruins dedicated to the patron goddess of the city. An amphitheatre that seats up to 3000. It is occasionally used today for concerts and musical productions. Daily features include bag pipers in traditional Jordanian military dress. Located just east of Oval Plaza. Features a collection of artifacts found during excavation, including coins, statuary and sarcophagi. The free Jerash brochure published by the Jordan Tourism Board includes a map, photos and recommended walking route. It can be found at the visitor center or Jordan Tourism Board in Amman. Anyone interested in history of Jerash may wish to hire a guide for JD 5, available at the ticket checkpoint in front of the South Gate. The entrance to the site is south of the ancient city, close to Hadrian’s Arch. The ticket office is in the complex of the souvenir shops along with a post office café. Tickets are checked later at the South Gate. Next to the South Gate is the visitor center, which has informative descriptions and reconstructions of many buildings in Jerash as well as a good relief map of the ancient city. There are toilets at the Jerash Rest House, visitor centre and souvenir shops area at the site entrance. Allow at least three hours to see everything in Jerash and make sure to have plenty of water. Best time to visit Jerash is before 10am or after 4pm because it’s cooler, less glare in your photos and far fewer people. Most of the buildings are at their best close to sunset. Remember that the public transport to Amman is limited after 5pm and it’s possible to leave your luggage at the Jerash Rest House while you visit the site. It’s free! Two thousand years ago, the great urban trading cities of the Middle East were born when Middle Eastern and Western societies came together in a tremendous synthesis of commerce, art, and culture. Their legacy shines today in the splendid cities of the Graeco-Roman and Arab east, such as Petra, Jerash, Gadara, and Palmyra. The full power and glory of that ancient drama is revived in Jordan every summer in the form of the two-week-long Jerash Festival of Culture and Arts. 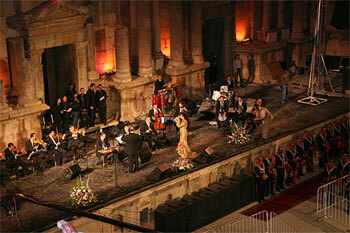 Since 1981 the ancient city of Jerash has hosted the annual Jerash Festival under the sponsorship of Queen Noor. The Jerash Festival usually takes place during the end of July and beginning of August .It showcases a wide array of singers, musical and folklore troupes, poetry readings, symphony orchestras, ballet, Shakespearean theatre, handicrafts, and art shows. The colonnaded streets, plazas, and theatres of Jerash all provide unique venues for these acts, under the balmy summer skies of central Jordan. While performances take place in the different arenas, thousands of visitors also enjoy strolling through the ancient streets and monuments of the city, shopping for handicrafts, taking in art and book exhibitions, enjoying a casual meal, or simply absorbing the powerful drama of East and West meeting in a great cultural jamboree. Skilled craftsmen and women display Bedouin rugs, jewellery, embroidery, glass, wood, metal, and ceramic objects, and also demonstrate on the spot how they create their wares. Events are listed in English in the official souvenir news sheet, the Jerash Daily, printed in English every day of the festival. Events are held in the South Theatre and Oval Plaza in Jerash, as well as the Royal Cultural Centre in Amman, and other places like Umm Qais and Mt Nebo. Tickets cost at least JD 5 for events in Jerash and about JD 20 for more formal events in Amman and elsewhere. They are available from the Royal and Haya Cultural Centres and the domestic JETT bus in Abdali in Amman. JETT also offers one-way and return transport to Jerash during the festival. It’s advisable to buy your tickets well in advance of arriving in Jerash and can be bought at the Jerash Festival office, next to the visitor centre near the South Gate. The hippodrome has ten starting gates (carceres), as opposed to the usual twelve, which have now been re-assembled from the rubble with other missing stones quarried and rebuilt. The seating area (cavea) was four meters deep with sixteen rows of seats. The seats accommodated 15,000 spectators who, it is said, were Greek-speaking even during Roman times. The Jerash Heritage Company has started daily ticketed performances of the Roman Army and Chariot Experience (RACE) at the hippodrome in Jerash. The show runs twice daily, at 11am and at 2pm , and at 10am on fridays, except Tuesdays. 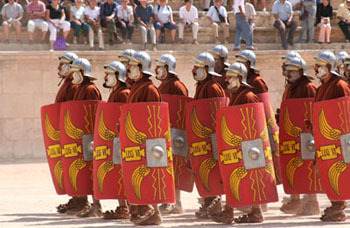 It features forty-five legionaries in full armour in a display of Roman Army drill and battle tactics, ten gladiators fighting “to the death” and several Roman chariots competing in a classical seven lap race around the ancient hippodrome. The performance lasts approximately 45 minutes. Please take your seats 15 minutes before the start of the show. There are no hotels in Jerash, but there are a couple of decent places to stay in Ajlun, 22km northwest of Jerash. Located 7km from Jerash, this place has swimming pool, tents, barbeque grills, hot showers, game rooms. Taxi from Jerash costs JD 2 one way; to Amman costs JD 10 to JD 12. Driving: Drive 5km from Jerash towards Ajlun, turn right for 1km and right again for another 2km. Rooms come with balcony. Features a fantastic outdoor terrace garden where meals can be served in summer. Hotel is 1.3km from Ajlun by the turn-off to Mar Elias. Jordan Dinar divided in 10 dirhams, 100 qirsh or 1000 fils.